(AINA) -- The vice President of the Assyrian International Congress of Georgia, Mr. David Adamov visited North Iraq, Erbil, as a member of the Georgian delegation, from 28th -- 30th November 2006. The delegation consisted of members of Georgian authorities, business and Non governmental organizations. 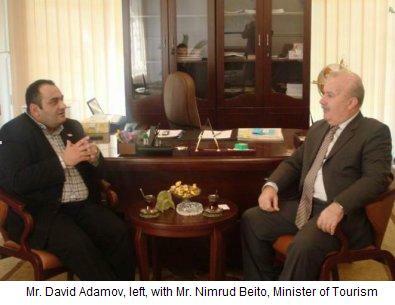 During his visit Mr. Adamov had official meetings with Mr. Nimrud Beito, Minister of Tourism and Mr. George Mansour, Minister of Civil Society Affairs in the Regional Government of Kurdistan. He also met the Minister of Culture and Minister of Internal Affairs of the same Government. During the meetings was discussed the socio-economical, cultural and political situation of Assyrians in the region. Mr. Adamov met the Assyrian Community in Ankawa. He visited the Chaldean Culture Society and Ankawa youth Center there. He also visited churches and met the Chaldean Bishop of Ankawa.